When we released our #MNFLAGSHIPBREWS project late last year, we had a single goal: to celebrate the craft beer movement in the state of Minnesota. We issued a challenge to breweries and fans of breweries alike. Share your flagship brew with us, and we'll feature it on an exclusive poster. That was the extent of the promotion. We know our craft beer suppliers work hard and passionately on not only their flagship brews, but on their business and supporting their community. It's an honor for us to partner with as many Minnesota craft breweries as we do. Here's an overview of how #MNFLAGSHIPBREWS mapped out! We didn't include any parameters on submissions for the project, just that it had to be a Minnesota native. Founded next to the Cottonwood River in 1860, Schell's is not only the state's oldest brewery but one of the nation's oldest too. The brewery is still Schell-family owned, in its sixth generation of operation and brewing and given its date of inception, one of the few Minnesota breweries to survive prohibition. There were a half dozen nominations to see Schell's make it onto the poster with its Firebrick amber lager as the unanimous flagship brew. It's a big deal for craft breweries to celebrate their first anniversary. Imagine what it's like to celebrate 20 of them like Summit Brewing Company has. For two decades the St. Paul brewery has somewhat quietly managed impressive growth and now is sold in 14 states. Its Extra Pale Ale is the flagship "that launched a brewery," and pioneered craft beer in Minnesota. If there's anything predictable about the Minnesota craft beer scene it's that it grows. And grows, and grows. 2016 was no exception and some of the rookies already have fans, which is huge in the success of a new brewery. 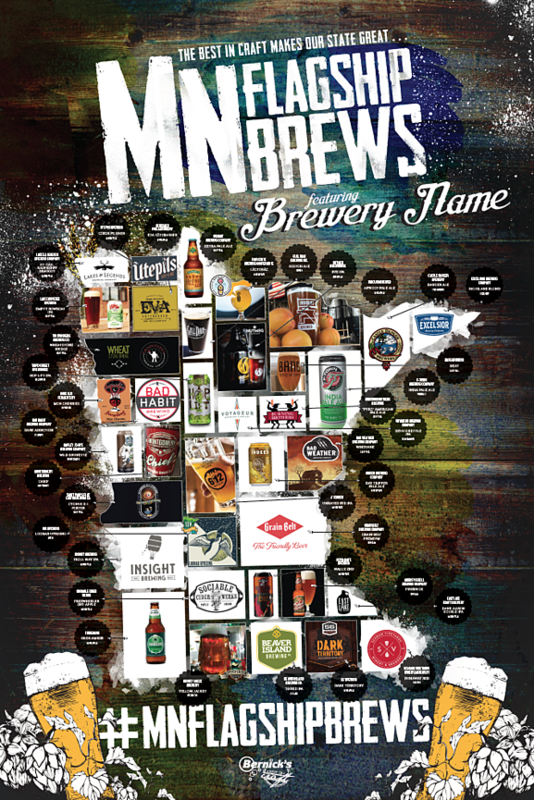 The #MNFLAGSHIPBREWS poster includes a few new names worthy of spots on the coveted landscape. In Norway, there's a word for longing for and anticipating the first beer enjoyed in the sunshine after a long winter. Utepils. And now in Minneapolis, there's a brewery that given the state's climate will offer utepils (OOH-ta-pilz) to its patrons year-round, regardless of season. Located on the banks of Bassett Creek between Harrison & Bryn Mawr neighborhoods of northwestern Minneapolis, Utepils’ 18,000 square-foot site will feature an iconic tap room, relaxing outdoor beer garden, and a full-scale European-style craft brewery. Czech Pilsner is the nearly open brewery's flagship feature. Minnesota's first cooperative brewery opened over two years ago but just relocated to Northeast MSP from St. Paul - and you can drink like you own the place. Fair State now has over 900 members and a board of directors. It's a completely different operation for small, independently owned breweries but it's working. It features a rotation of beer but the flagship noted was its LÄCTOBÄC - a pale wheat Saison. The point of the #MNFLAGSHIPBREWS poster was to celebrate the unique differences that comprise the state's vast landscape of beer making and beer drinking. Each nominating brewery or fan is receiving a customized poster featuring the 32 breweries to hang in taprooms, offices, bars, garages, or wherever there's cause to raise a glass. Any brewmaster will tell you beer is made to drink. And who drinks that beer? People in communities and towns all across the state.